Hello everyone and welcome to the Wow! 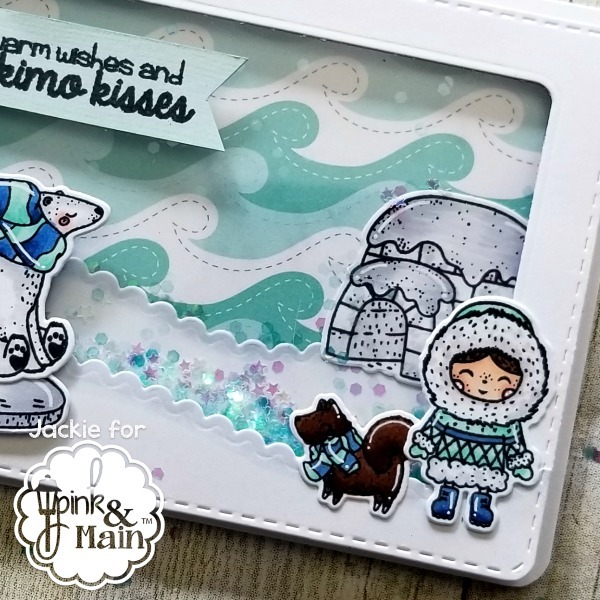 Embossing Powder Blog Hop collaboration with Pink and Main!! I am so excited to share a fun little project I created using these amazing embossing powders. If you have come from Donna’s blog then you are in the right place!!!! If you happened upon my blog and want to participate, head on over to the Wow! Embossing Powder Blog to start hopping!!!! Before we get to my project let’s talk about the blog hop details and prizes!! They are some exciting ones!! As you hop along, make sure to comment on each of the blogs for your chance to win an amazing prize!! The winner will receive a $25 gift certificate to Pink & Main store, 6 embossing powders and a carry case to the WOW! Embossing Powder Store. The winner will be announced on October 22nd. Enjoy!! So let’s get started!!!! 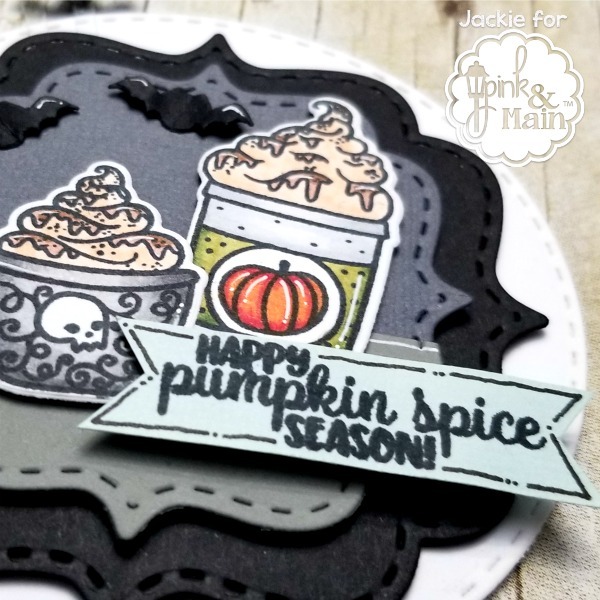 I paired up some amazing embossing powders with the brand new October release from Pink and Main. Definitely make sure to keep an eye out for their release next week!!! I decided to make my own background using some of the lovely Metalline First Frost (WG05R) embossing powder. It is such a soft color and worked well for my background. I used it for both my gift bag and matching card. I also used the gorgeous Primary Pink Robin (WH26R) embossing powder for the bow on my gift bag. This pink is absolutely stunning and was a perfect pop of color!!! I hope you have found some inspiration to use some of these embossing powders!!! You’re next stop is Jaine!! Enjoy your hopping!! Here is the blog line up in case you get lost!! Hello everyone!! 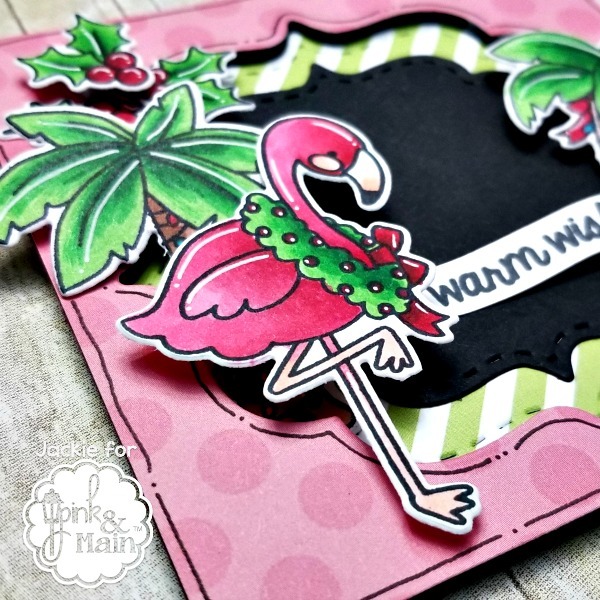 Today I am sharing a fun card using some Pink and Main products with you!! We are finally getting some “fall” weather down here in Arizona so this card was perfect to celebrate!!! I wanted a very soft look for this card so chose a simple white background paired with the Basket Cover Die also cut out in white. I then cut out the Wreath Base Die in two different green colored cardstocks. Using my alcohol markers and white gel pen to add some extra details to each leaf. I then nestled in my little hedgehog creature from the Fall Friends stamp set into the bottom of the wreath. 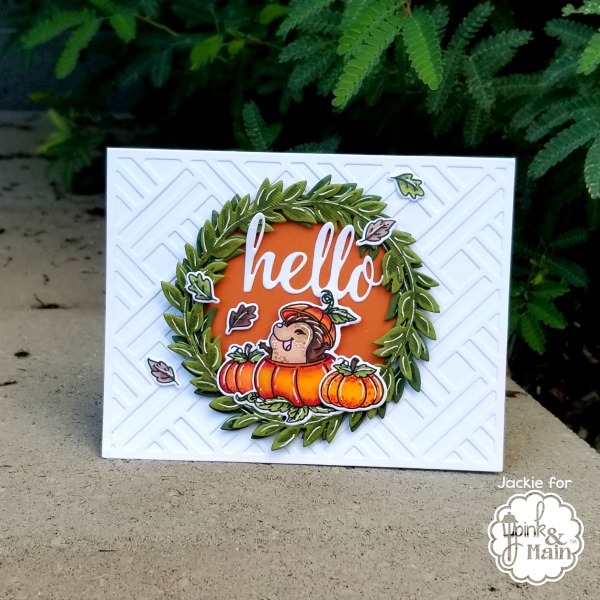 Last I cut out the “hello” from the Wreath Base Die for my sentiment and added some flying leaves throughout the card. 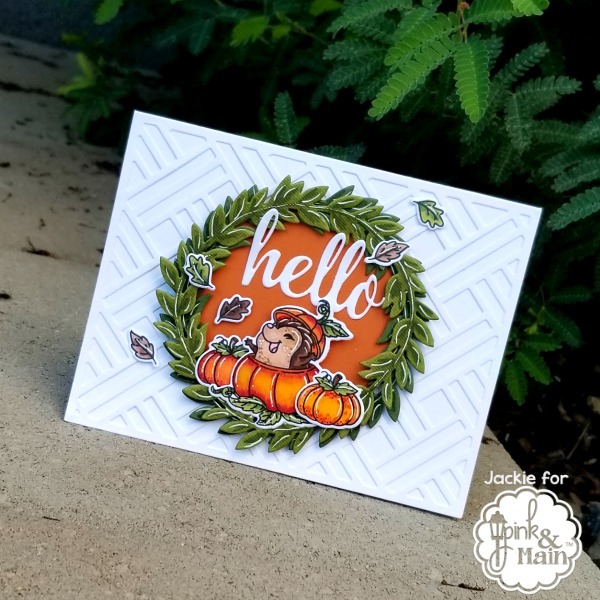 I hope you have enjoyed this fun little fall card!! Thanks for stopping by!! Hello everyone!! 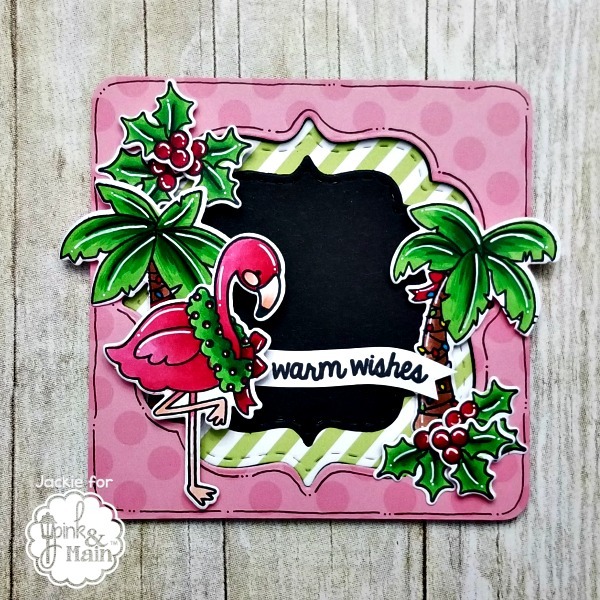 Today I am sharing a fun Pink and Main winter themed shaker card with you!!! I had so much fun creating this card. Shaker cards are one of my favorite types of cards to create!! How about you?? 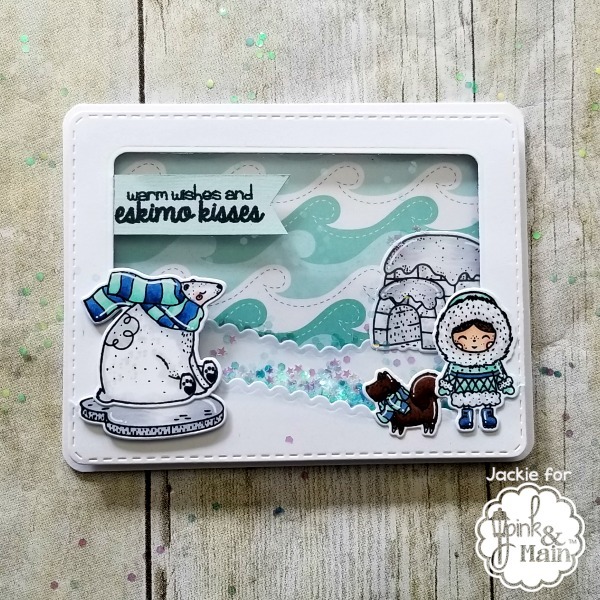 For my card today, I used the Eskimo Kisses stamp and die set. Pairing this set with the stitched rounded rectangle die and scalloped waves die. I even pulled in some ocean waves paper from the Beach Babe paper pack to set my scene. 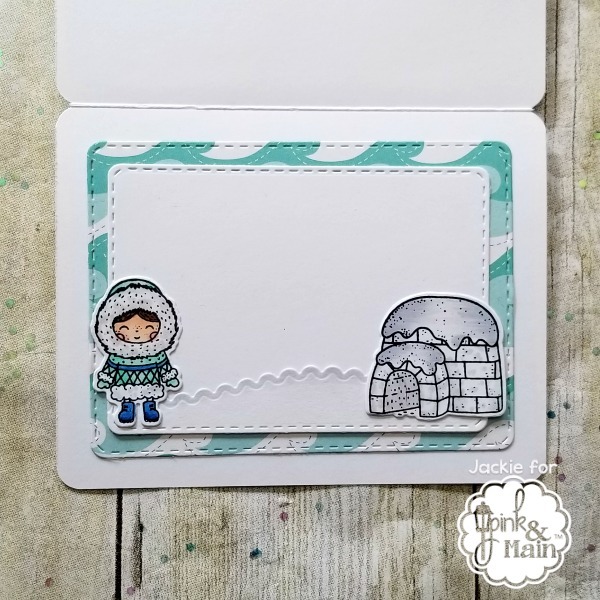 I wanted my card to have lots of dimension so placed one of my snowy scalloped hills and the igloo on the inside of the shaker card. I then attached another layer of scalloped hills on top of the shaker window. This was a perfect place to pop up my adorable little polar bear, eskimo and dog!! One of my favorite things to do with a card is to continue the scene onto the inside. It’s definitely not as elaborate as the outside but some fun for the recipient to open and find!! Thank you so much for stopping by!! I hope you enjoyed my card!!! Hello everyone!! 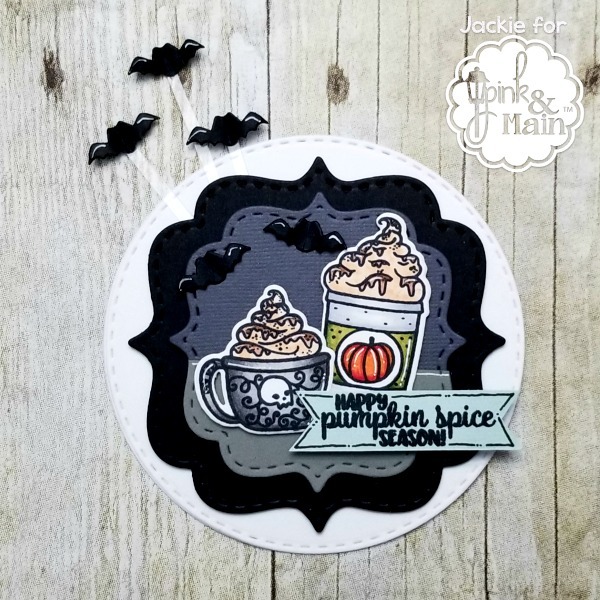 Today I have a fun set of Halloween Cards using the fabulous “Happy Halloween” Simple Set by Simple Stories. I am so incredibly excited for Halloween!! It is my favorite holiday!! How about you?? I can’t wait to send these spooky cards out to family and friends!! I decided to make a set of six cards and a matching box to keep them all in!! These little boxes are so easy to make!! Perfect for those larger scrap pieces you have left over!! You can find lots of tutorial on YouTube!! The first two cards I decided to use black cardstock for the base of my card. I love being able to write my note in a white gel pen. I find small details like that make it extra fun for your recipient!! I made sure to use lots of foam tape on my stickers to give extra dimension!! On the next two cards I cut apart some of the journaling cards to use as my embellishments. Again, using lots of foam tape for dimension. I’m a chunky crafter and feel a card can never have “too much” dimension!! Sometimes it requires extra postage…but that’s okay!! The last two cards I used journaling cards as my main embellishment. These two cards are much simpler than the others but still just as cute!! Thank you so much for stopping by. I hope you enjoy these fun and spooky set of cards!! Make sure to pick up your own “Happy Halloween” Simple Set and craft away!!! Hello everyone!! Today is the start of sneak peek week over on the Pink and Main blog!! I’ve got a fun, warm Christmas card to share with you!! Introducing “Deck the Palms”….I absolutely love this set!! Maybe more so because I live in sunny Arizona and am surrounded by palm trees!! I hope you enjoy it as much as I do!! Creating this card was super fun!! I used the paper collection Beach Babe as the base of my card. Using the Stitched Top Note Die I cut out a window on my pink patterned paper. I made sure to pop this entire piece to give the card lots of dimension. To give it a little more interest I did some “line and dot” detail around the edges using a black gel pen. I used the Stitched Top Note Die again on some green and white striped patterned paper and some black cardstock and layer those flat inside the window. Last, I stamped all my images out and colored them with my alcohol markers, also using a white gel pen to add some highlight. Some of the images are adhered directly to the card and others are popped up using some foam tape to create this fun Christmas scene. I hope you enjoy this card and the adorable sets that will be released next week!!! Thanks for stopping by!! Happy Pumpkin Spice Season…Halloween Style!! Hello everyone!!! I’m here sharing some Pink and Main goodies with you!! My all time favorite holiday is Halloween!! I love it!!! When you pair it with some pumpkin spice it’s even more amazing!! So that’s just what I did with my card today…. 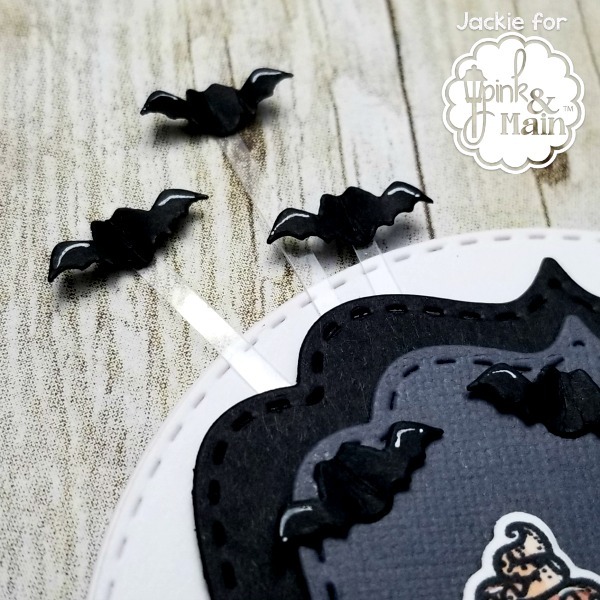 Using the new August release stamp and die set “Pumpkin Spice” I paired it with the bat from the Fall Wreath Decor dies to create my fun little Halloween scene. To create the base of my card I used the Stitched Circle die on some white cardstock. Next, I cut out some black, light and dark grey pieces using the new Stitched Top Note die. Of course I had to use the adorable little skull coffee cup as the main “drink” on my card. I wanted to give the sentiment a little more interest, so I made drew some lines and dots for added detail. To finish off my card I used some thin strips of acetate to adhere a couple of the bats to to give it them the illusion of flying off the card. I also used my white gel pen to add some highlights to each of the bats wings along with a slight pinch in the middle to make them more 3D. I hope you have enjoyed this card!! Have a wonderful day!! See you next time!! Hello everyone!! Got to love shaker cards!! They are one of my favorite interactive cards to create!! Make sure you head on over to the Craftin Desert Diva’s blog to see all the cards created by the design team!! Lots of inspiration!! Since I live in the desert, it only seemed right to create a little desert gnome complete with some cacti and all!! A little tip when creating a shaker card is to make sure the edges of your foam adhesive are not sticky. For those of you who don’t have a non-stick tool…no worries!!! Baby powder or corn starch rubbed on the sides works great too!! !